The rebuilt furnace operates beside one of TMAs new state-of-the-art Wet Dog furnaces. Photo: Courtesy Toledo Museum of Art. Photography by Andrew Weber. TOLEDO, OH.- Fifty years to the day after the first glass furnace fired up at the Toledo Museum of Art, three artists-in-residence recreated itbrick by brickto reflect the spirit of early pioneers of the American Studio Glass Movement. The "toledo workshop revisited Residency takes place over a 10-day period from March 22  31, mirroring Harvey Littleton and Dominick Labinos original workshop that happened between March 23 and April 1 of 1962. Artists Kim Harty, Amber Cowan and Matthew Szösz began the residency with the construction of the furnace, as part of TMAs Guest Artist Pavilion Project (GAPP), co-sponsored by The Robert M. Minkoff Foundation. Since there are no known renderings of the first furnace, replicating the design was a challenge in itself. Extensive research was needed to recreate it, relying heavily on interviews and photographs taken at the 1962 workshops. Most of the basic materials are pretty much the same today: insulating fire brick, standard fire brick, a burner block, a Johnson burner and some steel elements to hold it all together, Mack said. The key difference is that this furnace will have a flame sensor on the burner for safety. The original 1962 furnace wasnt used again after the first workshop but rather, was reconfigured and modified for the second workshop, held in June that year. 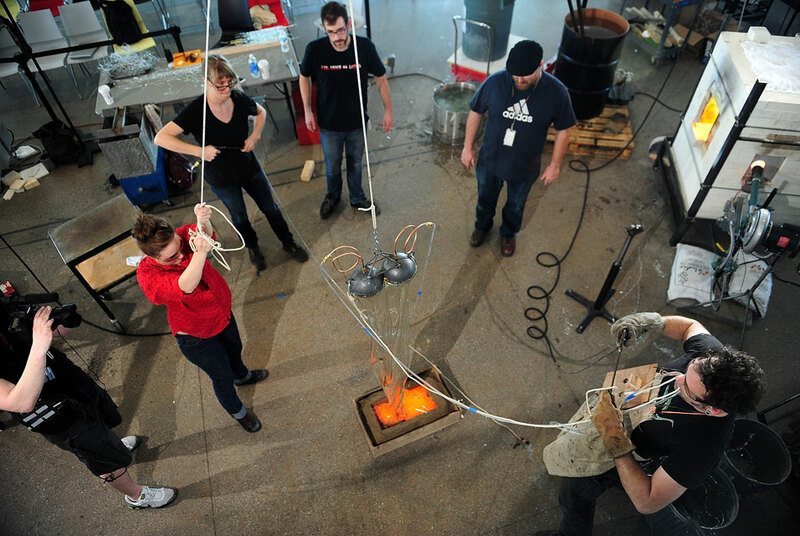 The rebuilt furnace will be used exclusively by the artists-in-residence to work molten glass. It's a tool, but also a starting point for their work while at TMA. Each artist was chosen because of the conceptual quality and inquisitive nature of his or her work. "The Minkoff Foundation wanted to connect a new generation of artists who directly experiment with glass with the pioneers of Studio Glass, said Andrew Page, director of the Minkoff Foundation. Amber, Kim and Matthew submitted proposals that reflect thoughtful responses to the history of the 1962 workshops, with an excitement about the potential for glass and a fascination with the material. Each in their own way, these three artists embody the ethos of the first workshop exceptionally well. It is a unique opportunity to celebrate the history and the future of glass at the same time." University of Richmond Museums presents "Woman as Image: Museum Studies Seminar Exhibition"